The Chinese producer price index (PPI) came in lower than expected today. The PPI for June measured -2.7% (yoy), which means the PPI has been negative for the last 16 consecutive months. This is, of course, partly caused by lower commodity prices that are used as an input to manufacture goods. For example, within the PPI, mining related input prices have fallen by 8.5%. But it’s far from the whole story. Taking into account the gradual decline in industrial production and export growth, and the massive deviation with the CPI (currently at +2.7%), the prolonged decline in producer prices suggests significant overcapacity in the manufacturing sector. But proving this is difficult. Hard data is either not available or dodgy at least. There is an abundance of anecdotal evidence, but it feels less comfortable using this in making the overcapacity case. But there is one, much more, tangible factor that, at least for China, seems to reflect the overcapacity issues of the manufacturing industry. The stock market. 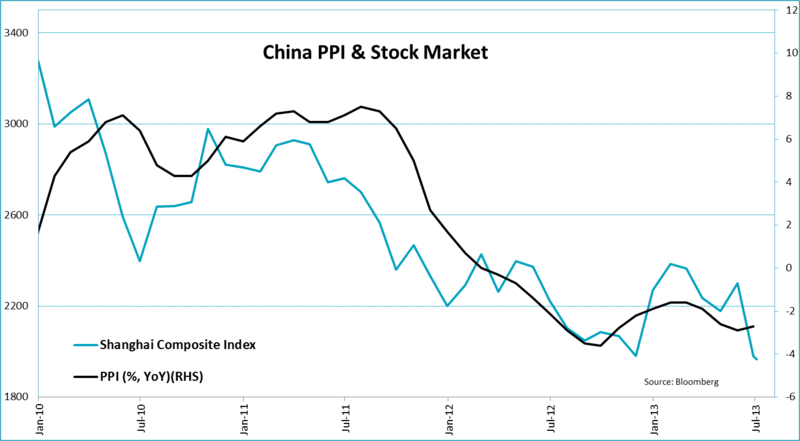 The graph below shows the development of the PPI and the Shanghai Stock Exchange Composite over time. The relationship between the two factors has been pretty impressive over the last couple of years. 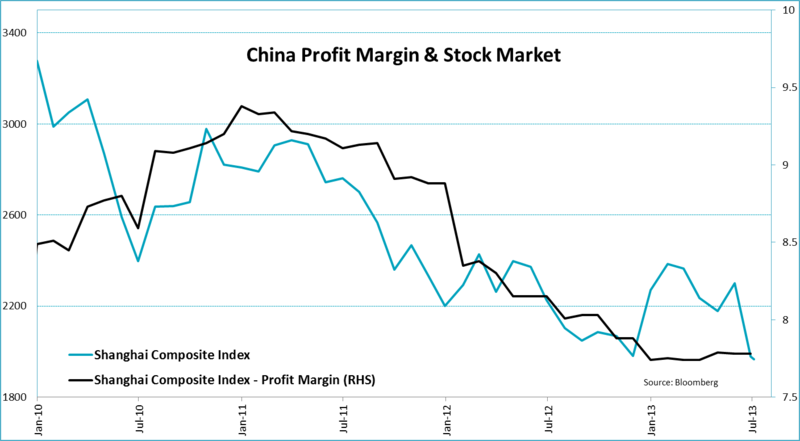 The case for the PPI as a measure of overcapacity becomes more enticing when profit margins are taken into account. In the next graph I plotted the average profit margin of companies in the Shanghai Stock Exchange Composite and the development of the index itself. The graph shows that when producer prices went down, the profit margin came down as well, underpinning the overcapacity story. Hence, the PPI seems to hold relevant information about capacity issues, and about the stock market, where these issues are reflected. Given that the PPI, and its underlying components, are published more frequently than earnings numbers, (expected) producer prices could prove themselves very helpful when looking at the Chinese stock market. ← Have Bond Yields Risen Too Much?